Microsoft has revealed new details of its xCloud game streaming service that lets people stream Xbox titles to a smartphone, PC or console. Players will be able to stream content not just in their own home, but from any location where there’s a good network connection. 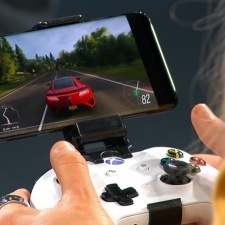 During last night’s Inside Xbox, Forza Horizon 4 was demoed on an Android mobile device, with the phone attached to an Xbox One controller and connected via bluetooth. Microsoft said its streaming service is powered by its network of Azure data centres in 54 regions and tech developed at Microsoft Research. The computing giant insisted that streaming is not a replacement for its console hardware business. Public trials for the xCloud streaming service will start public trials this year. Cloud gaming and streaming will be big topics of conversation and Pocket Gamer Connects Seattle on May 13th to 14th.